Hi, I am interested in your 1969 Chevrolet Camaro (stock #4670-ATL) listed on Autotrader for $47,995. I'd like to get more information about this vehicle and confirm its availability. Stuffing a big block into just about anything is guaranteed to make for an entertaining ride. 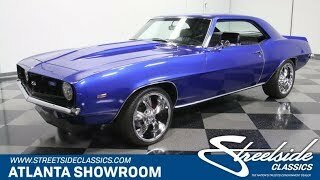 When its a 1969 Camaro and you dress it up shiny blue paint and a houndstooth interior, then youve really got something special. Built with a professional eye and attention to detail, this 1969 Chevrolet Camaro Restomod gives a nod to one of the most potent muscle cars of all time. Seriously, if you could have a vintage Camaro built any way you wanted, isnt this pretty much what youd wish for? The bodywork is in great shape and theres no mistaking that fantastic 1969 Camaro profile. The slick blue paint isnt this cars original color (that would be code 65 Olympic Gold), but who can argue with the results? A cowl-induction hood, chin-spoiler and ducktail spoiler, and an SS grille with integrated LEDs make it look predatory, and youll note that SS badges were applied fore and aft. There were no liberties taken with the Camaros classic shape, and it offers a few upgrades like the big chrome wheels and polished wheel well and door moldings, both of which do a lot to really dress things up. Its not a perfect show-car, but it is really nice and when its hammering down the road everyone will want to be the guy behind the wheel, and from that vantage point, this car is nothing but exciting. From behind the wheel, theres no way to tell that this isnt a beautifully restored Camaro. The houndstooth interior always looks elegant and sporty, and the workmanship is excellent throughout. The seats show no wear to speak of and are comfortable and supportive enough for long hauls, while the dash, door panels, carpet, and headliner barely looked touched. A center console features a horseshoe shifter for the sturdy TH400 3-speed automatic transmission underneath and auxiliary gauges hang in the usual location, although they have been upgraded with white-face Equus renditions. That sporty Grant GT steering wheel is a clever update of the original with a slightly fatter rim, and there are white-face gauges in the dash cluster that really grasp the drivers attention. The stereo system is a simple AM/FM head unit, but like many of the muscle cars we feature, the best music comes from under the hood and this car definitely fits the bill. It also offers a clean, well-finished trunk with a new reproduction mat for a very authentic look. Spectacular is one word for the mammoth 468 cubic inch big block under the hood. The punched and stroked motor takes no prisoners with an estimated 550HP, as the built big block is fitted with a bunch of go-fast parts carefully selected by the current owner-builder. Its also just docile and easy enough to manage in real-world traffic thanks to a Weiand intake, QuickFuel double-pump 4-barrel carburetor, and a massive aluminum radiator thats assisted by dual electric fans. An MSD ignition system lights it all up instantly and a set of shorty headers blow through Flowmaster mufflers to handle the exhaust. Beautifully dressed in finned aluminum valve covers and chrome air cleaner, it neatly straddles the line between street and race yet excels at both. Tubular A-arms, power disc brakes, and a power steering system are all up front to provide a genuinely pleasant driving experience, in case you like a little refinement along with your brute torque. 18-inch chrome Foose wheels provide a modern, flashy look, and that bling is wrapped in 215/40/18 (front) and 275/35/18 (rear) BFGoodrich performance radials. If youre looking for a weaponized 1969 Camaro, look no further. Big horsepower in a slick package, this 69 is a head-turner ready to tear up some asphalt. Call today!